“Ginger is best crop for the farms having acute water scarcity. With minimum water supply the quantity and quality of the produce is good as well as it is gainful because market demand is always high and price is stable,” shares Mr. Siddappa Madiker, traditional farmer from Gowdur village, Raichur district, Karnataka. 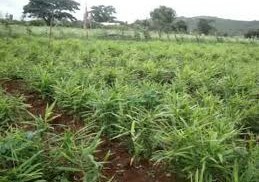 In his 9acre farmland along with ginger other crops grown are byadagi chilli in 2-3 acre, onion 20gunta and 4 acre dry land farm has sajje, pigeon pea (tur), groundnuts and jowar cultivation. “My farm suffers from water scarcity but I have to do farming as it is my main source of livelihood. Even all the borewells in the farm dried up. Seeing my not-to-give-up attitude towards farming one of the agricultural officers took me for farm visit where ginger was cultivated using minimum water. It caught my attention and I started doing ginger cultivation. It had been the right decision at the right time. Since past 4 years I am successfully growing ginger commercially and reaping good profits,” he shares the drive to grow ginger in his farm. In the farm, Bidaar variety (jawari) ginger is cultivated. “I selected this variety because it grows very well in less water and has good market in Bidar, Hyderabad etc. These markets are near to my farm hence money is saved on transportation cost,” he says. Mr. Siddappa grows sweet corn as intercrop with ginger. “Sweet corn has resistance towards fog and also it controls the diseases in ginger. These two crops complement one another,” he highlights. The first production quantity was 120 quintal ginger however the yield increases in subsequent years. In the last season, 50 quintal ginger was obtained from 7quintals seeds in 0.25 acre land. In the same land 2.5 kg sweet corn seeds yielded 15quintal. “Sweet corn is double profit as the left behind plant post harvest is used as cattle fodder for my cows at the farm. I save sweet corn seeds as well for the next season,” he informs. Ginger is grown best in red soil (large area) and moderately in black soil (but the area should be small). Jawari variety ginger’s quality appreciates if stored for more days. “In my farm I grow in the mix of red and black soil,” states Mr. Siddappa and adds, “I am using bed system to get more yield as bed will provide loose soil and tubers can grow or expand freely in this soil. If bed is not made, the yield is reduced.” It is sown in June-July and harvested from January onwards till August. If it is sown after July the yield reduces. Commonly ginger crop is attacked by rot disease that leads the plants to dry thus to save the crop from it, “I spray 2 gram Takat, 2 gram kavach and 1ml score in 1litre water. The crop might get attacked by the red disease so I spray M45 reagent (2 gram in 1litre water). I spray only if there is disease attack. If it is attacked by green insects then I spray coregent (1ml in 1litre water),” he explains. Post harvesting the crop is rotated and ginger is planted in different patch of land. Ginger produce is sold in Umnabad, Bidar district as it is near to the farm. Onion is sold locally. Bydagi chilli is sold in Byadagi market, Haveri district. “This year market price trend so far is stable at Rs. 4,500/quintal and I have invested Rs. 50-60 thousand so I am expecting Rs. 1lakh profit,” he reveals. In future, Mr. Sidappa wants to diversify in goat farming and sericulture. 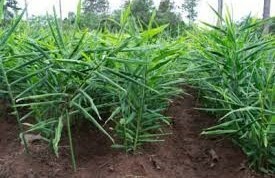 “We can grow ginger organically but yield shall be less. Now slowly and gradually I have started reducing use of chemical fertilizers and increasing the quantity of organic manures used in the entire farm. Farming is profitable and sometimes we may incur loss too. It depends upon how we look after the crops,” he signs out.